The Continental 5860 24" x 48" platform truck features a structural plastic construction, and its rounded corners protect against accidental wall and door damage. It will not rust, dent, crack, chip, peel or splinter unlike conventional metal or wood. The handle is made of reinforced steel to ensure a long product life, and the 24" x 48" deck has a generous 700 lb. capacity. 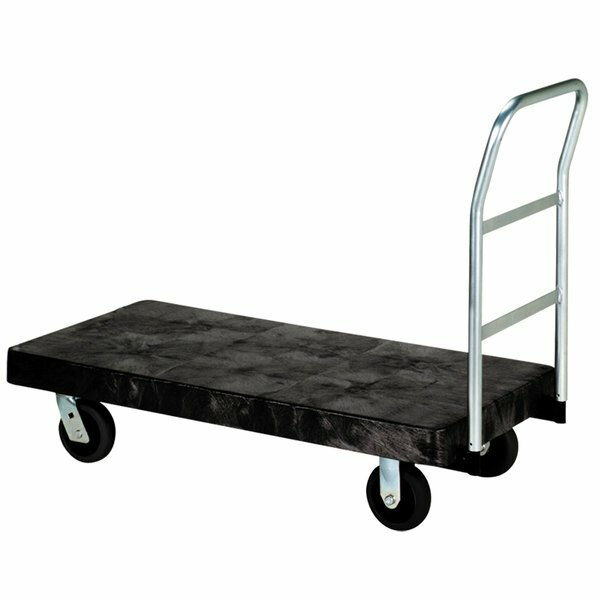 For easy maneuverability, it rides on 5" rubber casters with integrated nylon bearing sleeves. Soft rubber tread and shock-absorbing cushioned sides combine for optimal floor protection and quiet operation in temperatures ranging from -4 to 180 degrees Fahrenheit. Rubbermaid FG9T0700BLA Heavy Duty 5th Wheel Wagon Platform Truck - 70" x 40"